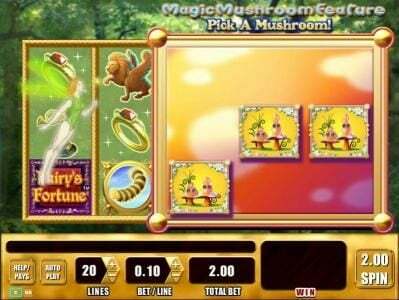 Fairy's Fortune online slot machine pictures and slot feature list from WMS, play Fairy's Fortune Slots for free. 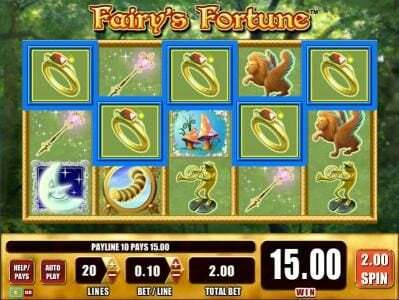 Fairy's Fortune Slots has not been reviewed yet, be the first to rate this slot. 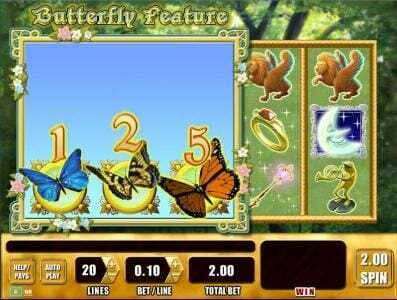 WMS’ Fairy’s Fortune has 5 reels and 20 lines. 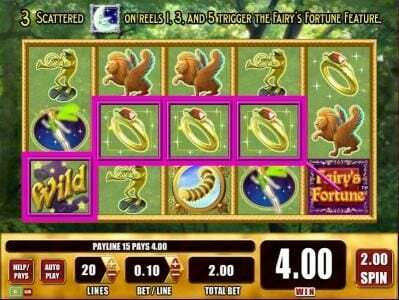 This fairy themed slot offers wild symbols, scatters, and includes a top payout of $25,000. The game is themed around fairies and around other mythical creatures which have found their way on to the pages of many story books. It’s an enjoyable design, with lots of bright and light colors, with the green of the forest visible both on the reels and behind them, and with the various symbols being used generally taken from the stories that you’ve read as children. If you have any kind of interest in these fairy tales and the childish theme doesn’t bother you, chances are that you will have lots of fun playing this game. 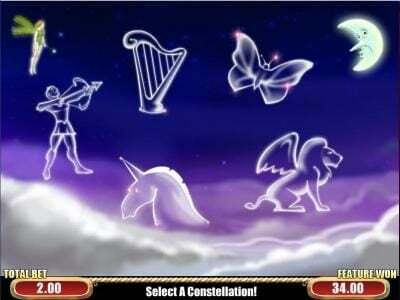 The symbols of the slot give you access to images with a wizard’s hat, mushrooms, the moon, the logo of the game, a fairy, a wand, a ring, a gryphon and a toad. Placing a bet in this game isn’t too difficult, with the decision of the player being made on the number of lines which have to be used and on the value of the coins that are allocated to these lines. Up to 20 lines can receive bets in this game, and it’s a good idea to use all of them in your bets. The coins start at $0.01 and go up to $5 in value, while the maximum bet goes up to $100. The coin value also determines the value of the prizes. 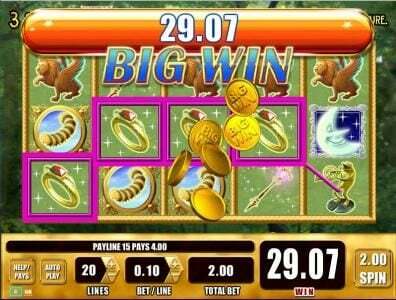 The top payout of the Slot is 5000 coins, or $25,000. The game logo will award the top jackpot of Fairy’s Fortune, as long an entire active line is filled with these symbols (wilds can help out). The main feature in a lot of games is the wild, and for the most part this is the case here as well. It’s the image with the wizard’s hat and it can substitute for many of the other symbols, but not all of them. There are three symbols here which will not be replaced by the wild. The wild is also limited to only three of the five reels (1, 3 and 5). The moon symbol will appear as a scatter on the 1st, 3rd and 5th reels, and when all three are present the Bonus round of the game is activated. The player has to make a number of choices and he gets prizes each time. 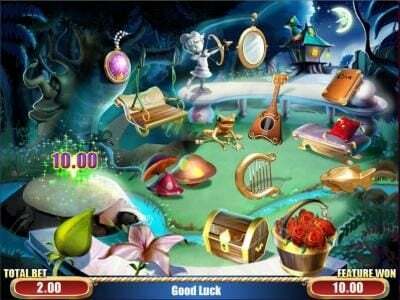 It’s an enjoyable game and it will be especially fun if the fairy inspired theme is something you generally enjoy.